I made this wreath for my nephew for his high school graduation. 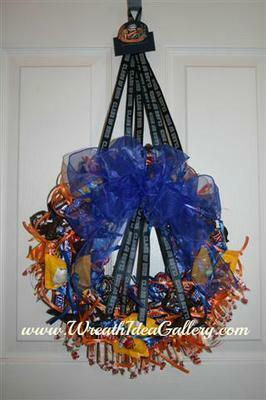 I tied candy to a wire wreath form using his school colors blue and orange. 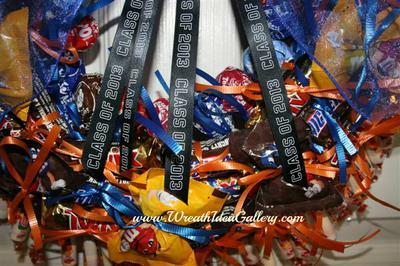 I found some ribbon that Class of 2013 on it and used it to make the wreath holder, and then used the additional ribbon for decoration streamers. 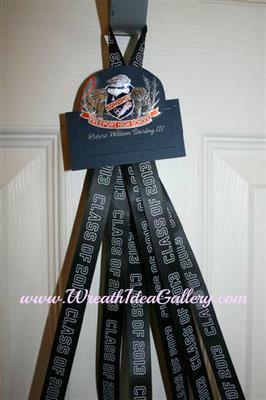 I took part of his graduation announcement and cut the school emblem and used the name card that comes in the announcement and glued them to the top of the ribbon to personalize it for him and the occasion. I made the large blue bow with a wire ribbon that way the ribbon can be shaped and stand out from the wreath. It was a beautiful graduation night and we are very proud of our nephew for completing this special milestone. I do not think he had seen a candy wreath before but he seemed to like it and I know he will enjoy it for the next few weeks. Join in and write your own page! It's easy to do. How? 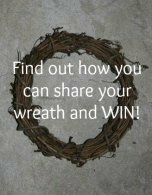 Simply click here to return to Wreath Gallery Reviews.